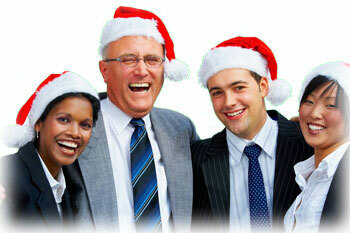 Make your Office Christmas Party planning easy! Planning the office Christmas Party can often involve a lot more blood, sweat and tears that anyone can imagine. Add the pressure from the entire office to make this party a memorable one... sound like fun to you? It can be! Our Event Hosts work with your ideas and concepts and apply fresh, innovative entertainment ideas to have everyone talking about the Christmas party for months. Providing a unique entertainment experience based on your company's corporate culture is our specialty. We listen to you in order to accommodate your groups musical tastes. If you want to mix in all the traditional Christmas carols and songs like White Christmas and Frosty the Snowman - we will play them for you. Packages from 2.5 hours up to 8 hours are available for your Christmas party. We have listed a few of the most popular Christmas Party packages. If you don't see what you are looking for - please contact us and allow us to work with you customizing your party and having guests dancing the night away. Up to two and a half hours of professional entertainment at your Christmas Party. One of the live game shows we host including: Name That Tune, Music Bingo or Christmas Trivia. Game show prizing is to be supplied by contractor. Request cards and pencils placed on your guests tables to make requesting songs easy. Up to four hours of professional entertainment at your Christmas Party. Cordless microphone available for announcements, speeches and activities during contracted times. Up to five hours of professional entertainment at your Christmas Party. Personal planning consultation with the Event Hosts /DJ's that will be working you to ensure we understand your vision. You get to meet and plan with the Event Hosts/DJ's that will be working with you at your Christmas Party!